The front porch is a great place to spend an afternoon, especially with cool spring days ahead. The key, of course, is having a good place to park your rear end. I think these blue rockers do the trick. From the Hardin County, Kentucky Amish settlement. More on Kentucky Amish furniture. 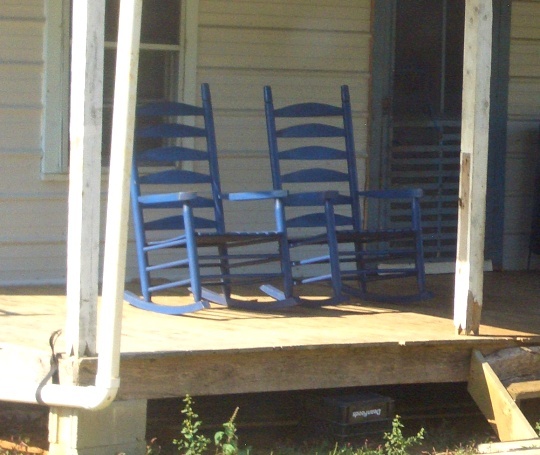 Ive always loved hickory rockers myself, although the blue rockers in the picture look comfortable, id add a pillow with a glass of ice tea and ill be set pretty much for the whole day. Richard from Penn. I think Richard and I think a lot alike! 🙂 Those rockers are adorable. Yep, “therapy chairs” is what I call ’em! The rocking motion is soothing (physically and mentally—that’s why we “rock” babies to sleep—often on rockers! ), and although you’re still “sitting”, you’re using more muscles and expending more calories than if you were “just” sitting. In my opinion, if we had more rockers, we’d all be a happier bunch (as a society). Add a peaceful, natural setting (as most Amish “homesteads” seem to be), and you can probably chuck the antidepressants, too! Alice Mary, “therapy chairs” has got it right–I do enjoy a nice rocker. The ones in this photo are of a classic design–not as comfortable as the contoured hickory rockers many Amish have, but I wouldn’t complain. Richard may be right about the pillow though. A hickory rocker, if you’ve never had a chance to sit in one, is surprisingly comfortable. I guess it’s the good craftsmanship and fitting the wood to the curves of the body. Some Amish also make a “wide-load” version with an extra large seat. I took this photo in a Swartzentruber Amish community; you often see doors and other items painted blue in the plainer Amish communities. I’ve yet to see a blue hickory rocker, though. I am in the market for some nice rocking chairs. However, my wife is wanting a porch swing so I guess I need to get that first. I’ve been looking at rockers recently. Just love them. I really enjoy having my early morning coffee on the porch in the spring and summer and watch the world wake up. For me it starts the day off right. I am out there about 4:15am. The birds start their first chirping around 4:30am as the sun just starts to peek over the horizon. What a way to start the day!! to try to find the blue rockers. As you probably know Al this is quite a small community, there were a number of businesses though. I stopped for produce, I recall a horseshoer and some smaller-scale type businesses. Beautiful sparsely-populated country in Hardin County, or at least that part of it. Alice, do you have some cows to milk that we don’t know about…? 4:15 am?! That’s impressive, Amish farmer time. I do like getting up and at ’em but that’s a tad on the early side for me (however in Poland at the peak of summer sun starts coming up at 3:30am, which is still surreal to see). No cows, LOL. I just like getting up early in the warmer months. We can get pretty hot and humid here in the summer so I like to get my work done early. My neighbors might not like it though, I am usually pushing the lawn mower about 6am, LOL. Luckily I do not have anyone on either side of me to wake up. I suppose if I did I would have to re-adjust my times a bit. The first hour or so is my time. Its quiet, I can reflect, pray and get motivated for the day. Then take care of the cats and dog. By then it is time to get busy with yard work. Get it out of the way before the heat of the day. 🙂 As it starts to warm up, I move inside to work. Usually need a nap in the afternoon but that’s OK too, LOL. My body seems to do this naturally. I have never set an alarm clock in my life. Right now I am waking up at 5am but each week gets a little earlier and earlier so it won’t be long and the 4:15am body alarm will be going off, LOL. Like I said Richard, if I had neighbors next to me I would have to adjust my time,,, but I don’t. But the city workers are out at 7am making all kinds of noise so, I would only push it back to 7am, LOL. I’ll remember if I ever live near you to hide my gas can really well, LOL. No hiding necessary Alice, the solution for you would be a battery operated lawn mower, problem solved. And on your mower a special beer aroma machine would be mounted to give the neighborhood that delicious beer smell. solving problems is what i do,Now if i only had room for that peanut dispenser. Richard from Lebanon county’s Amish community. No, no, no Richard. No beer aroma machines on my mower, can’t stand the smell of beer and I don’t drink so won’t promote it. I think the solution is you just get your sweet self out of bed a little earlier, LOL. Oh, and I believe you think you are in heaven cause you are moving me out there, LOL. Blue Amish Rockers? It should be a music act made up of Amish Musicians, or musicians dressed Amish. I think. Alice, your schedule is impressive 🙂 Where I live, quiet hours end at 6am, so you are well within your rights to let rip with the mower! I sleep with earplugs myself, so am usually protected from the earliest birds. I would like the porch and the rockers, please! Most homes built around here now don’t include a nice wide porch. Like Shom’s idea for an Amish band. Blue – no depression, just mellow and peaceful. Erik, thanks for posting these older blogs on Facebook so newer faces like myself can enjoy the history of Amish America community.